I was going to say that this novel is Robert A. Heinlein writing science fiction at the top of his form, but his top is a high and extensive mountain range. Heinlein started strongly in 1939, was by 1941 generally acclaimed the best or among the best in the field, and strengthened that position for a quarter of a century. 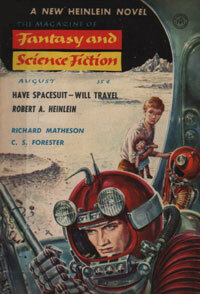 Have Space Suit — Will Travel was originally published as part of Scribner's juvenile or young-adult book list. The dozen Scribner's science fiction juveniles by Heinlein began with the great adventure of Rocket Ship Galileo (1947) and went on through Citizen of the Galaxy (1957), a masterpiece. The quality of these novels ranges from good — to excellent — to defining the top of the chart. Have Space Suit — Will Travel was the twelfth and last of these. What would have been the thirteenth is Starship Troopers, which was rejected by Alice Dalgleish and the entire Scribner's editorial board. The best ages for characters? I can make my central character any age she wants at the opening of the story. But it can only be one age. If she will tell me what age she thinks is best for the market, I can tailor the central character of my next book to fit. But I can't make him simultaneously of draft age and of junior high school age. Nor can I keep him from growing up as the story progresses without limiting myself to a simple action story spanning not more than a few weeks. This is difficult to do in space-travel stories — but I can do it if she wants it. Heinlein manages such a feat of compression in Have Space Suit — Will Travel, a space-travel story that is not simple, and with no sense of limitation. Aside from an opening flashback in which the narrator relates some of his high-school and small-town background, the action is compressed into a tight time-frame, all smooth and inevitable. Heinlein solves the age problem, tailoring for whatever the juvenile audience may be, by placing his adventure in the spring and summer of the year the hero (and narrator), Clifford "Kip" Russell, graduates from high school: implicitly, he's around age eighteen. The second main character, no less important to the story and a wonderfully vital person, is Patricia "Peewee" Reisfeld, almost twelve. There is nothing slight, second-rate, or if you will, juvenile about Have Space Suit — Will Travel. Heinlein never talks down to his audience. Kip and Peewee are smart young people and do not need baby-talk from the author. Heinlein's good characters are regular folks, and if they wind up doing things brave or heroic, it seems to them that it was force of circumstances. Why, you'd probably do the same in their shoes. And they make mistakes, judging best they can on what they know. The bad people may be weak or nasty or both, but they seem all too much like regular folks also, likewise forced by circumstances into bad courses. But in the course of a Heinlein adventure, we see what kinds of people make which choices. Heinlein doesn't give these young people a kid-plot, either; Kip and Peewee get enough curves (orbital, life-death, super-cold, judicial, and space-time) thrown at them to curl your hair. The progression of the plot is like taking off under multi-gravity acceleration, very steep but plausible, and it keeps you pressed into your chair, reading. Although the time-frame is compressed, the action is wide-ranging. Without giving too much away, I can say that Heinlein's affinity for the Moon does its magic very vividly here (as elsewhere). If Heinlein hasn't lived on Luna, you couldn't tell it by me. The title Have Space Suit — Will Travel is not pasted onto a general space adventure; it is exactly descriptive. Earth's Space Age is fairly new here; there are Lunar bases. The key to all the action is the hero's firm desire to go to space, specifically the Moon, a possible goal but in his situation, an extremely unlikely event. But a long-shot chance appears, mundane though it may be, and Kip works hard to make it happen: a soap-slogan contest (lovingly detailed — Heinlein enjoys advertising, public-relations, politics) in which first prize is a trip to the Moon. Kip finally does win a lesser prize: a spacesuit, used but genuine. Here is where Heinlein's engineering background greatly buttresses the reality of the story. During World War II, Heinlein helped develop high-altitude pressure suits at the Philadelphia Navy Yard. He knows his stuff, and describes it so naturally that you can feel the air tanks pressing on your back, smell the old-socks odor inside, and see the dials glowing in your helmet. It all seems so reasonable, Kip working at the soda fountain, selling soap bars but retaining the wrappers for the soap-slogan contest; the frenzy of entering hordes of slogans; Kip refurbishing his spacesuit lesser-prize in his workshop; field-testing the spacesuit (as best he can) in his backyard. And — when you least expect it — to space he goes. And then the plot really begins to move. I could say that I've read Have Space Suit — Will Travel a dozen times, but I've lost count. At least a dozen. Brilliance and warmth, Heinlein-propelled.